If you want to do serious post-production work in Pro Tools but you can't stretch to an HD system, Digi's new DV Toolkit 2 could be the answer. In the June issue we took a look at Digidesign's new Music Production Toolkit. Now we are going to explore its partner in the Digidesign software stable. The DV Toolkit is a bundle of software that likewise 'unlocks' a range of additional features for LE users (though unlike the Music Production Toolkit, it's not available for M-Powered users), this time enabling them to handle post-production work on an LE system. The most important of the 'unlocked' features are the enabling of the timecode ruler and other timecode-related features which are otherwise available only on HD systems. The software bundle includes Digitranslator 2, which enables Pro Tools systems to read and write OMF and AFF files to and from video edit systems like Apple's Final Cut Pro and Avid's various editing systems, as well as other digital audio workstations. 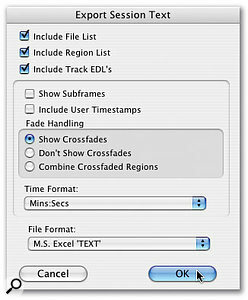 For more information on Digitranslator 2, OMF and AFF files and how they are used take a look at 'Working With Video In Pro Tools' in the February 2006 issue of SOS. 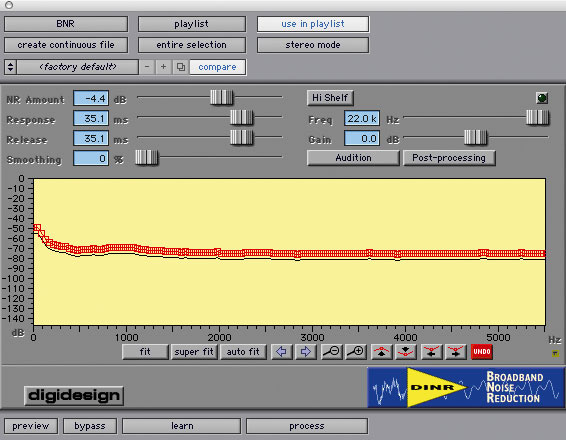 Digibase Pro is a powerful librarian tool for managing sound effects and samples. In addition, there's an LE version of the word-sync'ing application Vocalign from Synchro Arts called Vocalign Project LE, as well as an LE version of Digidesign's own noise-reduction software DINR. The original DV Toolkit cost around £700, and video production houses found that it enabled them to use a Pro Tools LE system to put together an audio post-production rig for around £3500, as opposed to having to get an HD system and still have to buy Digitranslator as well! Now Digidesign have released a new version called DV Toolkit 2, and for the same sort of price you get loads more features. In addition to Digitranslator, DINR LE and Vocalign LE, you now also get a whole load of features that were previously available only on HD systems, as well as further bundled software. The highlight among the 'unlocked' features is Digibase Pro, which enables you to make and share custom catalogues of media files likes sound effects or samples and do keyword searches from very detailed comments fields, audition the files, and import them into the Session, all from within Pro Tools. Digibase has been covered fairly extensively in SOS before, for instance in our May 2003 review of Pro Tools 6 and this year's series on working with video so I won't go into detail here. 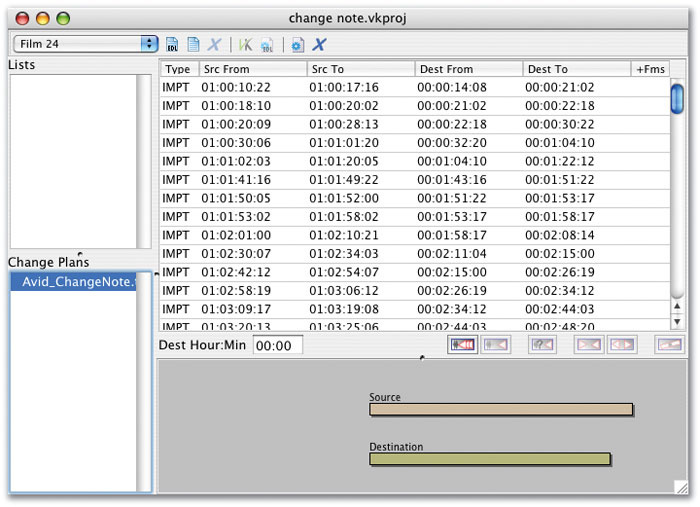 Other features that were previously HD-only include the Replace Region and Edit to Timeline Selection commands. 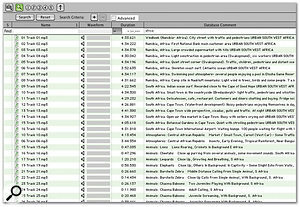 The Replace Region command enables you to replace all the instances of a particular Region in a Session with another Region in one go, while the Edit to Timeline selection command enables you to copy selections between the timeline and tracks when the Edit and Timeline selections are unlinked. 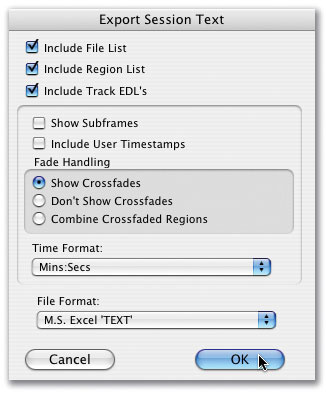 Another command, Export Session Info as Text, enables you to export Session info as text in range of formats so you can bring the data into a spreadsheet or database. The DV Toolkit 2 also enables the enhanced Import Session Data features found in HD, where you can choose to import only certain types of data from a source track onto a destination track. For example, I use it to bring in multiple plug-in settings as well as routing from a template Session into a working Session from a client. The Scrub Trim tool also becomes available (right), enabling you to Trim the end of a Region and scrub it at the same time. This is very useful when you are working to picture, as the video will scrub with you as well. DV Toolkit 2 adds the 'continuous' scrolling option, where the Regions scroll past a stationary cursor continuously like a piano scroll. For this to work well you need a well specified computer, especially on the video display side, as the continuous scroll mode puts a much greater load on the CPU. Another user-interface addition is the Universe Window, which gives you a simple global overview of an entire Session. When you click on a section you are taken to that section immediately in the Edit window, making it a very speedy way of navigating around a large Session. Another major improvement is the implementation of snapshot automation. This enables you to be able to write automation values for multiple parameters in one step, so taking the automation settings for one Region and imposing them on another, all in one go. 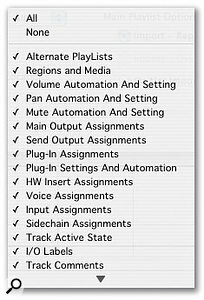 Just like the Music Production Toolkit, DV Toolkit 2 expands the number of tracks available in Pro Tools LE to 48 and these can be mono or stereo, so it is possible to have 48 stereo tracks (96 voices) all active in an LE Session. This is another area where the speed of the computer, the memory available and the speed of your hard drives will all contribute to how many tracks you will achieve. Digidesign recommend at least a 2GHz dual-processor G5 Mac or an equivalent high-speed Windows box like a Dell Precision Workstation M60 to achieve a the full track count. However, on my 1.67GHz G4 Powerbook I was able to play back 32 stereo tracks from the internal drive, even through Digidesign recommend either two Firewire or two SCSI drives for high track counts. Both Toolkits also include the MP3 Option, which enables you to export MP3 files direct from your Session. This audio-alignment tool is aimed at both music and post-production. It works by applying varying amounts of time-stretching or compression to one section of audio (the dub) to match the alignment of the 'guide' audio. For music, it is great for lining up vocal layers so all the syllables sync up. For post-production, it is perfect for sync'ing up replacement dialogue. 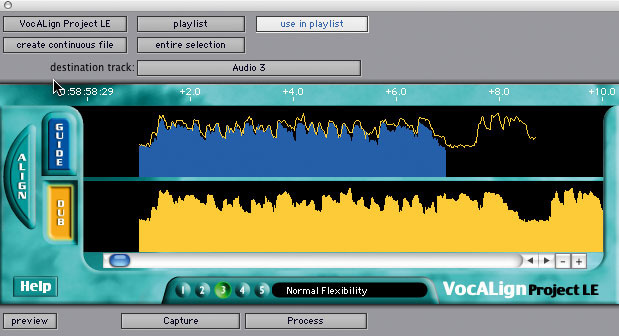 Once installed, you will find the Vocalign plug-in under 'Other' in the Audiosuite menu. 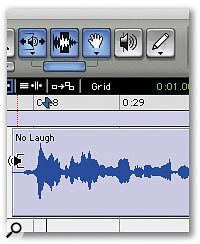 Highlight a section of guide audio (in the screenshot above, Steve Guide 2 on the top track) and capture its profile into the top half of the plug-in window. Then select the appropriate replacement audio (in this case Twit-Dub on Audio 2) and capture its profile into the bottom half of the plug-in window. Click on the Align button and you will see a new outline profile over the guide profile. Finally, select a destination track (in this case Audio 3) from the plug-in window and then hit the Process button. Vocalign Project LE will create a new Region based on the audio from the 'dub' track but now in sync with the guide audio. This example is taken from the tutorial Session provided by Synchro Arts on their web site; as you can see, the timings are very different, but when I played the guide in sync with the new dub version, the result was amazing. They play in sync, but the dub version still has all the character of the untreated version. Now manufacturers' examples are always going to be impressive, so I tried it on a vocal track from a recent project, taking two takes of a solo vocal that were very different in style and running Vocalign Project LE on them, and again the sync was excellent, without messing up the performances. With Vocalign Project LE it is possible to concentrate on the performance knowing you can sync it up later. By the way, even if you don't read the whole manual for Vocalign Project LE, enjoy the extra hand-drawn graphics in it — a lovely bit of light relief! As well as the existing DINR LE and Vocalign LE, the DV Toolkit 2 also bundles two other pieces of software. TL Space Native Edition is a convolution-based reverb from Trillium Lane Labs. We covered this in the June issue, as it is also included in the Music Production Toolkit bundle, but I would add that TL Labs have an excellent range of 'post'-friendly presets including car interiors, corridors, a variety of domestic spaces including bathrooms and kitchens, and a whole range of 'small spaces' like the inside of a tin can! You can download loads of extra presets from the Digidesign web site to add to the presets that come as standard. VK Conformer can automatically apply edits to your Session to reflect changes to the video cut.I had a play with some of the Effects presets — leave them to download overnight, as it is a 284MB download — and some of them are very weird. My favourite is 'Cinderella's Record Player'. The 'Tiny Spaces' are amazing, and include a preset of a vacuum cleaner hose as well as flowerpots and iron buckets. However, the most useful to me will be the range of 'Speakers & Phones'. These are great for radio drama where you need to 'play' music through a transistor radio or ghetto blaster. Digidesign have also teamed up with Virtual Katy Development Limited to offer all DV Toolkit 2 owners and upgraders a free copy of Virtual Katy's VK Conformer, or the full version of VK2 for a special price of $500. This enables Pro Tools users working to picture to re-conform a Pro Tools edit to reflect the changes that have been made to the corresponding picture edit. Rather than starting again by importing the OMF of the new picture edit from scratch and remixing the whole Session, you can call on Virtual Katy to work from the changes between the old and new Sessions, modifying the existing Pro Tools Session to match the revised picture cut. VK Conformer is a limited-feature version of the main Virtual Katy application VK2, and is designed to work from Change Plans created from the full VK application, so someone will need to have a full system to create the Change Plans before they can be implemented on low-cost systems with DV Toolkit 2 and VK Conformer. 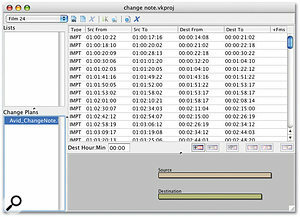 However, they have also enabled VK Conformer to work with Avid Change Notes, so if your video editor adds a dummy track, the changes to that can be exported as a Change Note in text form and VK Conformer can modify your Session to match the picture changes. It is quite spooky to watch Pro Tools copying and pasting sections of your Session all by itself as VK Conformer controls Pro Tools. While it is copying and pasting it moves all the automation data as well. You still need to go through the Session and massage the new edits to get them to 'work', but that is so much easier and quicker than having to start from scratch every time the pictures are re-edited! The first time I ran VK Conformer I had to check 'Enable access for assistive devices' in the Universal Access section of my System Preferences but after that it just did it. VK Conformer wasn't immediately intuitive in its operation but once I had studied the manual for a bit it all became clear. The PDF manual could do with some work on the layout and formatting; it isn't a smooth read, and I much prefer to read manuals on paper. This is an Audiosuite-only broadband noise-reduction plug-in from Digidesign. The sales literature bills it as 'an award winning' plug-in. Well, it might have been when it first came out, but noise-reduction and restoration software has come on in leaps and bounds since DINR was first released. Just to remind myself what it was capable of, I went back to the material from my restoration shootout in the August 2005 issue. As DINR LE is only a broadband noise-reduction package, I tried it on the Hiss file I had used in that shootout. DINR was very poor used in a single pass — I could only get around 4dB of noise reduction before horrendous birdie artifacts appeared — but if I processed it four times with this setting, the hiss reduced progressively with each pass. It would score four for ease of use and four for quality of processing. With care, a good clean section of the offending noise, and multiple passes of light processing it will help in the case of an emergency, but if you need serious noise-reduction software then look at the Sony Oxford or Waves restoration bundles. VK Conformer is really the icing on the cake of the DV Toolkit 2. This is a package that opens up most of the features you need to do post work in Pro Tools at a cost that is still far lower than the cheapest HD system, and will make a huge difference to anyone working in this field. As with the Music Production Toolkit, I feel that one or two features should be in PTLE as standard, most notably the expanded track count, and DINR is nearing the end of its useful life, but overall, this is a very well thought-out and well-priced software bundle. There is no real alternative for the DV Toolkit 2 as a complete bundle, as no other plug-in will enable timecode rulers and all the other features that the DV Toolkit 2 unlocks. Equally, there isn't really anything like Vocalign Project LE other than its big brother Vocalign — so all in all, this is a unique bundle which Digidesign have priced well. The unlocked extra features enable an LE system to handle loads more functions previously only doable on an HD system. 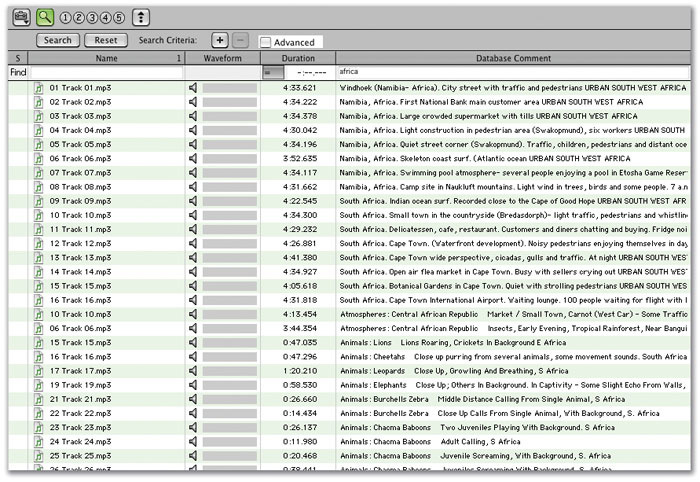 Digibase Pro gives very powerful search options from within Pro Tools. TL Space Native is an excellent reverb plug-in with loads of 'post'-friendly settings. The offer of a free copy of VK Conformer is inspired. Digidesign should look at including the higher track count into the standard LE versions at no extra cost. DINR LE has long been superseded by much better noise-reduction plug-ins. Put your DINR in the bin, Digi, it's gone off! Needs a very fast computer to get the most out of it. Digidesign's DV Toolkit 2 is a very well priced package, ideally suited for low-cost high-power 'audio for picture' post-production straight out of the box. They have taken the original DV Toolkit and just made it better, by adding a convolution reverb and unlocking many previously HD-only features in Pro Tools itself. £910.63; upgrade from the original DV Toolkit £205.63. Prices include VAT. Digidesign UK +44 (0)1753 655999.